[ Bill for Removing the Civil Disabilities of the Jews, 1834. ] Contemporary manuscript transcript of the conclusion of the debate on the motion for the second reading of the bill. 21pp., 4to. On six loose bifoliums. In good condition, lightly aged and worn. Incomplete: paginated 23 to 32 (the last a mistake for 33). "New Edition.- Forty-Fifth Thousand", London, William Mackintosh and Morgan and Chase, London; G. Gallie, Glasgow; J.Wright & Co., Bristol, [1866?]. Pamphlet, 32pp., stitched and unbound as issued, printed covers grubby, foxed and sl. chipped, contents good. [Pamphlet; Jewish Community] Scheme of Government Assistance in Connection with the Civil Disturbances of December, 1947. 16pp., 8vo, unbound as issued, stapled, minor marking, mainly good+. For background, see Ari Ariel, "Jewish-Muslim Relations and Migration from Yemen to Palestine [...]", p.71. Riots succeeded the UN decision to partition Palestine - with the consequences to the Jewish community this pamphlet addresses (inc. claims for damage). No copy in BL; none recorded in COPAC/WorldCat. 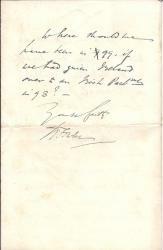 Signed Autograph legal opinion of Sir George Jessel ('G. Jessel'), regarding an 1849 action regarding the 'Title to Haskins Orchard in Payhembury Devon' between Elizabeth Harbin Gooddin, John Gooddin, Mrs Wain. 'G. Jessel | 5 Stone Buildings | Lincoln's Inn | 26 Feby 1849'. Folio, 3 pp. On two pieces of paper, 33 x 41 cm. 84 lines. Clear and complete. Fair, on aged and lightly-discoloured paper. The reverse of the last leaf is docketed '1848 | Abstract of the Title to Haskins Orchard in Payhembury Devon'. The upper part of the first page carries the last part of a deed of covenant, transcribed in another hand, with a query in the left-hand margin in Jessel's autograph, initialed by him. Beneath this, and continuing to the end of the third page, is Jessel's opinion, beginning 'I have perused this abstract on behalf of Mrs.
Small archive of official documents, newspaper cuttings, photographs and manuscript material relating to his war experiences. An extremely interesting and moving if frail survival: items of various sizes, many discoloured, creased, frayed and stained. The first item, 'THE HISTORY OF THE PRESTATAIRES IN ALGERIA. | Dedicated by one of them to the Major, recruiter of Pioneers for the 337 Alien Coy. in Hussein Dey.' 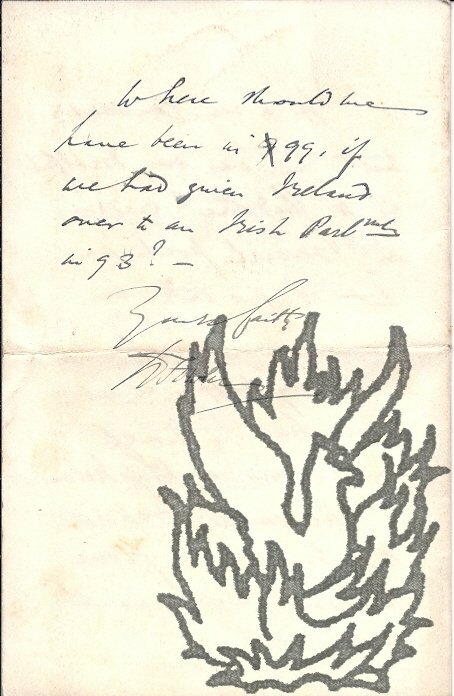 (two typewritten A4 leaves, both backed with grey card), dated 'Kenadza, 28 February 1943', explains how 'Before June 1940 there were more than 3,000 of us who did our duty in the fight against the onslaught of the Axis. Typed Letter Signed to the journalist and author M[yer]. J[ack]. Landa. 1 February 1937; 39 Elm Tree Rd, N.W.8, but on blindstamped House of Commons letterhead. Soldier and Tory politician (1893-1996), at 6 ft 7 inches the tallest ever Member of Parliament. 1 page, 16mo. Dusty but in good condition. He asks Landa to forgive him for not having thanked him earlier for assisting him with his lecture 'The Jew in Parliament'. He is grateful for 'the extremely valuable notes which you allowed Mrs. Knollys to take, and I feel that I can face my audience with equanimity and confidence.' Pencil notes on reverse giving addresses of W. A. Rutkowski, Samuel Lipman and Aaron Samuels. One Autograph Letter Signed, one Autograph Card Signed, one calling card bearing unsigned Autograph Note, and one obituary from an unnamed newspaper. Sir Philip Montefiore Magnus, Bart. Card to C. H. Grinling of Red Roofs, Peaslake, Surrey: 15 December 1928; letter: 13 June 1930; both fromTangley-Hill, Chilworth, Surrey; calling card and newspaper cutting without place or date. Educationalist and biographer of Kitchener and Edward VII. All items are in good condition, but bear traces of rust from paper clips. The card is 1 page, 12mo, with printed letterhead, and carries two stamps and postmark on reverse. He is going to London the next day and will stay till Thursday. He will be happy to see Grinling on Sunday or Monday if convenient and he will try to be at home. The letter is 1 page, 8vo. In it he thanks his correspondent for the 'interesting papers which I will return'.